A teenager from Billingshurst was among four people seriously injured in a collision yesterday in Northchapel. Police are appealing for witnesses to the collision on the A283 about 5.23pm on Monday, July 9, which led to the road being closed for around five hours. A police spokesman said: “The incident involved a blue Peugeot 508, travelling south, and a white Volkswagen Golf, travelling in the opposite direction. “The driver of the Peugeot – a 48-year-old man from Worthing – sustained serious injuries. 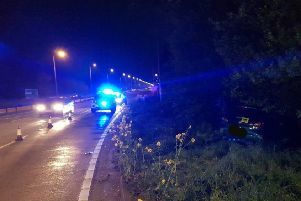 “The driver of the Volkswagen – a 48-year-old woman from Godalming in Surrey – and two passengers – a 16-year-old girl from Godalming and a 16-year-old boy from Billingshurst – also sustained serious injuries. Anyone who saw the crash or who has any dash cam footage is asked to report it online at https://www.sussex.police.uk/rtcappealresponse or phone 101, quoting Operation Emley. Police are also appealing for anyone with any residential or commercial CCTV covering the A283 at Northchapel to come forward.